Birthplace staff recently organized and uploaded two new additional collections that provide important insight into the history of the movement to tax land values in the United States and Great Britain. The two collections – The United Committee for the Taxation of Land Values and The Freeman and Related Documents, 1920-1943 – feature original correspondence and other documents inaccessible elsewhere. 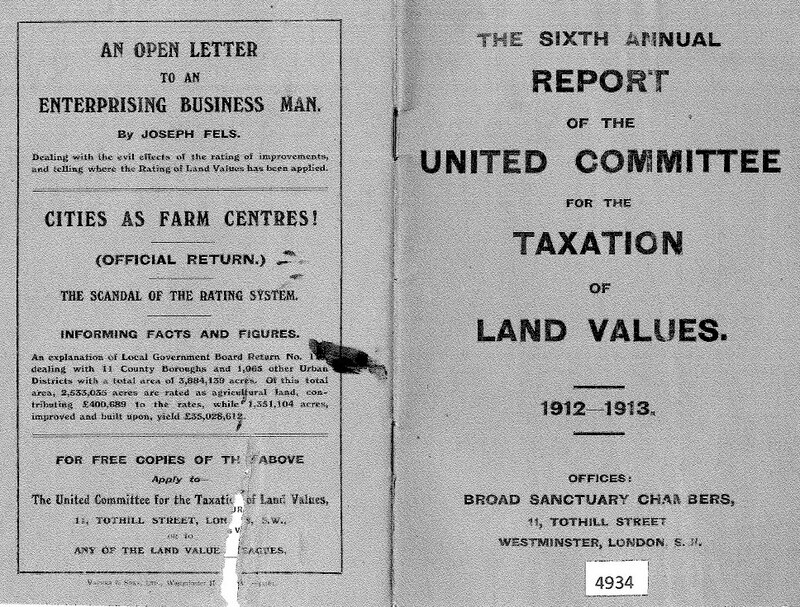 The United Committee for the Taxation of Land Values formed March 23, 1907 during a meeting called to address the need for a committee representative of the land value taxation movement in all parts of the United Kingdom. Among the groups represented by the United Committee included the English and Scottish League for the Taxation of Land Values. During its first decade, the United Committee devoted much of its officers’ time and resources toward press campaigns designed to spread awareness of and lobby for the taxation—or rating, as it was often called in England—of land values at the local and national levels. Many of the leaflets and other pamphlets published toward this end are available in Series Two of this collection. To learn more about the history of the United Committee visit the collection webpage. The Freeman and Related Documents, 1920-1943 consists of historical material surrounding the formation and publication of two periodicals by the same name at different points in time with similar objectives: to promote critical thought and study of social and economic issues. The founders and editors of both journals were also sympathetic to the movement to tax land values. Albert Jay Nock and Francis Neilson published the first issue of The Freeman on March 17, 1920. Nock, a seasoned journalist and Neilson, a Liberal Party leader in the British House of Commons from 1910-1916, hoped the journal would challenge what they viewed as liberalism’s turn away from its core values and towards state-sponsored socialism in the interwar years. Although The Freeman enjoyed mild success, Nock and Neilson decided to cease publication after only four years to work on other projects. Both, however, continued to write and publish. Many of Nock and Neilson’s works can be viewed in Series One. Thirteen years after Nock and Neilson vacated the editorial offices of The Freeman, several trustees of the Henry George School of Social Science established a new journal committed to the discussion of social and economic issues – The Freeman: A Monthly Critical Journal of Social and Economic Affairs. Although the journal’s publishers claimed that the new periodical was in no way “a revival of the old Freeman nor an attempt at it” the paper covered much of the same ground and counted Nock as a member of its Editorial Council. New York Times economics reporter Will Lissner served as The Freeman’s first editor-in-chief followed by HGSSS Director Frank Chodorov. Despite its close relationship to the School, The Freeman’s publishers did not intend for the journal to serve as the organ of the HGSSS in any official capacity. Still, The Freeman gained a reputation as the mouthpiece of the Henry George School. In 1943, The Freeman Board of Directors voted to cease publication and in 1944, The Henry George News was established to report on the activities of the Henry George School. In addition to the correspondence and writings of The Freeman’s editors and other staff, The Freeman and Related Documents also contains material pertaining to a 1938 essay contest sponsored by the journal. Open to all readers, the contest promised $100 to the individual who submitted the best plan for removing all taxes save those on land values. Many of the entries including the award winning essay by Walter F. Fairchild are found in Series Two. To learn more about the history of The Freeman, visit the collection webpage.